Rendering of MacArthur Park Metro Apartments. Courtesy of McCormack Baraon Salazar. 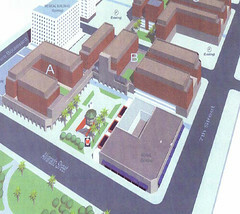 The first phase of the latest project of Metro’s Joint Development Program breaks ground on Monday. 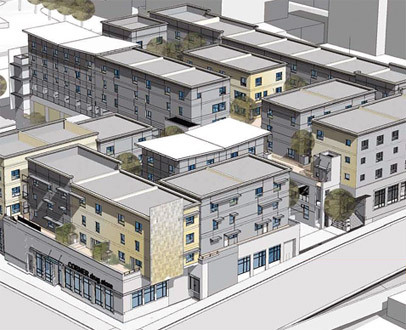 MacArthur Park Metro Apartments is a $45 million joint venture between Metro, McCormack Baron Salazar, Los Angeles Housing Partnership and Polis Builders to bring mixed-use development with 172 affordable housing units and over 30,000 sq. feet of retail to parcels above the Westlake/MacArthur Park Red/Purple Line Station. The first phase of the project will sit above the subway tunnel adjacent to existing retail on the corner of Alvarado and Wilshire. Phase A will have 90 affordable housing units and 15,000 sq. feet of retail in addition to 100 parking spaces for Metro customers. The project will also bring improvements around the subway station and nearby streets. New sidewalks, curbs and gutters, street trees and underground utilities are planned. The public plaza and subway portal will also be upgraded with special attention given to the Westlake Avenue side of the parcel which is home to many bus stops. The hope is that MacArthur Park Metro Apartments will bring economic development – both short and long term – to the neighborhood as well as provide safe and affordable housing to residents and encourage transit use. The ground breaking takes place on the Westlake/MacArthur Park Station site at 10:00 a.m. on Monday, April 12th.